Rabidly anti-Catholic Texas pastor Robert Jeffress, who led the blessing of the new American embassy in Jerusalem at the invitation of Donald Trump, has said Satan is behind Roman Catholicism. 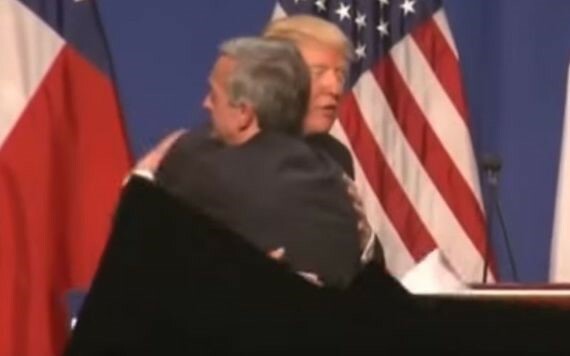 Donald Trump and Robert Jeffress embrace during the 2016 Presidential Campaign. “This [Catholicism] is the Babylonian mystery religion that spread like a cult throughout the entire world. The high priests of that fake religion, that false religion, the high priests of that religion would wear crowns that resemble the heads of fish, that was in order to worship the fish god Dagon, and on those crowns were written the words, ‘Keeper of the Bridge,’ the bridge between Satan and man. “That phrase, Keeper of the Bridge — the Roman equivalent of it, is Pontifex Maximus. It was a title that was first carried by the Caesars and then the emperors and finally by the Bishop of the Rome, Pontifex Maximus, the Keeper of the Bridge. “You can see where we’re going with this. It is that Babylonian mystery religion that infected the early church. One of the churches it infected was the church of Pergamos, which is one of the recipients of the Book of Revelation. And the early church was corrupted by this Babylonian mystery religion, and today the Roman Catholic Church is the result of that corruption. “Isn’t that the genius of Satan? If you want to counterfeit a dollar bill, you don’t do it with purple paper and red ink. You’re not going to fool anybody with that. But if you want to counterfeit money, what you do is make it look closely related to the real thing as possible. Rabidly anti-Catholic Texas pastor Robert Jeffress. Jeffress has previously claimed that the gay rights movement “will pave the way for that future world dictator, the Antichrist, to persecute and martyr Christians without any repercussions whatsoever,” and has declared that the September 11, 2001, terrorist attacks represented God’s judgment for legal abortion, reports RightWingWatch.org. Jeffress insisted his Trump appearances during the election don’t amount to an official endorsement, which would threaten the church’s status as a 501(c)(3) nonprofit. He said, ‘He’s going to be the best leader, he’s going to be the best for the economy … he’s going to take care of ISIS, and he’s gonna take care of the border and all the things I talk about,” Trump said. “And he said, ‘He may not be as pure as we think, but he’s really good and a great Christian,’ and that’s what I wanted to hear.